One of the hottest bridal wedding trends right now is painted leather bridal jackets, not forgetting hand painted pleather jackets, and we are definitely here for it! We absolutely love the idea that a bride or bridesmaid can design a jacket that incorporates their personal style, and their wedding flowers/wedding theme. Whether you want a Bride, Mrs or Wifey design we can create a jacket that suits you, and your bride squad. With our hand painting design service for your bridal jacket we can both source the jacket for you, or paint a design on a jacket that you already have. We can source blush pleather jackets, ivory pleather jackets and black real leather bridal jacket or black pleather wedding jackets. We can even hand paint a denim jacket with your chosen floral design to make a unique denim jacket for you as a unique whimsical bride. The jackets can be designed around your bride squad ready for the hen party, matching jackets and we can design them to be wearable even after the wedding day. The sky is the limit with our design options, so if you want a cat portrait hand painted, or your wedding flowers hand painted on a jacket for the evening of your wedding day we can create something just for you. Prices start from £159 so check out our shop for more inspiration and get in touch to start designing your dream wedding jacket! So you're engaged, Congratulations! But where to begin when you start planning a wedding? Well we are here to help you plan the different elements of your wedding day with a simple check list. It might seem daunting but some details listed below may not have even crossed your mind! From when to send out your wedding invitations, to when you need to book caterers for your chosen wedding date, this list will be the best place to start building the plan of your big day. Agree a budget, be realistic! If you need to add an 10%+ allowance do it! Research wedding photographers and or/videographers, try and meet as many as possible. Book your photographer and/or videographer when you have found the best fit. Research & book engagement session for any time between now and your wedding day, this is a great way to get comfortable with your photographer, and creates the most beautiful prints for friends and families, even for your wedding invitations. Set up your wedding gift list, some lovely ideas are: Charity Donations, Wine gift list, honeymoon contributions. Attend the reading of your Banns (you don’t have to attend but it’s a special public occasion where the congregation may be invited to pray for your happiness so you might want to hear this). Your Banns must, legally, be read in the parish where each of you lives as well as the church in which you are to be married (if that is somewhere else). Your Banns will be read out in church for 3 Sundays during the 3 months before your wedding (usually over 3 consecutive Sundays). Check your passport & renew if it will expire before you travel. If it’s still valid, you don’t need to renew your passport but ensure that the name on your travel docs matches your passport. Find Something Old, Something New etc,. Arrange to change the surname on your driving licence, bank etc,. When Elizabeth Rose was created, our founder Sophie began a journey of discovering what Brides, Bridemaids and wedding guests felt was missing from the wedding industry. Quite quickly Sophie noticed a distinct lack of interesting and beautiful flat wedding shoes available to those seeking a comfortable alternative to high heels on the wedding day. So it is of no surprise to know that our flat satin wedding shoes are one of our most popular styles. The beautiful ballerina pumps are handmade in the UK and then hand-painted in our London studio by Sophie herself. The satin shoes can be hand-painted with anything your heart desires, whether its your wedding bouque flowers, a sentimental item, or even your beloved pet, we design the shoes with you in order to create the perfect wedding shoes just for you. To get you inspired, we have picked out some our most popular designs below. At Elizabeth Rose, we are ALL about personalisation and we love finding other brands who create keepsakes for your wedding day in a completely unique way too. Our latest crush is Hermione De Paula and their absolutely breathtaking gowns, within each you will find an extra special personalisation detail, exquisitely embroidered. A further personalisation possibilty can be found in hand-painted leather jackets, Leather jackets for brides and wedding parties are so chic right now and Elizabeth Rose now has a leather jacket collection ready for you to personalise. We can handpaint your first song lyrics, your favourite quote about love, and of course your married name. The sky is the limit with our custom leather jackets so get in touch to start designing your own, and for price quotations. What about the groom we hear you say? The sweetest personalisation we have seen for grooms is this hand stitching of initials just under the collar. Creating the perfect keepsake and secret between the two of you. Perfection. So you have decided to take the next step and propose to your love, your lobster, your one. As soon as you start googling 'engagement rings' you will be inundated by standard single diamond engagement rings, or the 4c's diamond explanations, but spending your budget that you have carefully saved on a ring that your partner might not completely and utterly adore is a bit daunting. Our first thoughts as wedding designers is poor you! 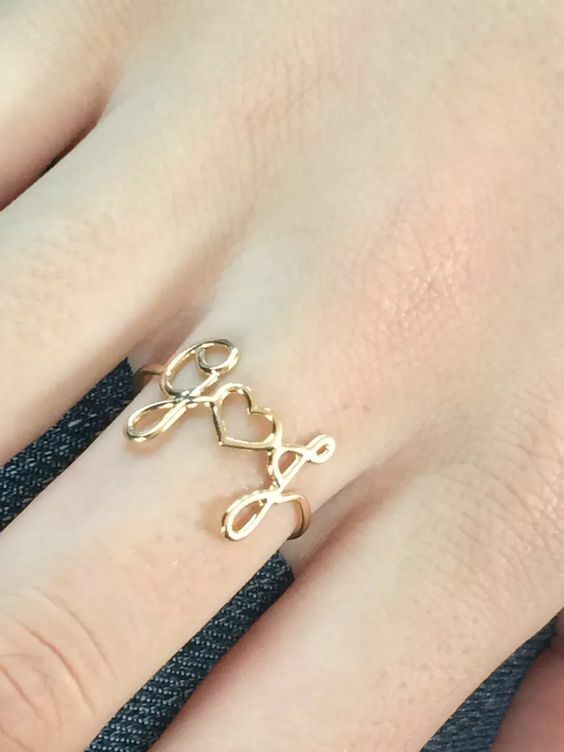 So we wanted to let you know about the other options you have at your disposal, there is something called a place holder ring that carries the same sentiment, and cute design, without the commitment to a ring that spent all your budget before knowing what your partner will want to wear everyday. Newsflash, at Elizabeth Rose our designer Sophie is also an engagement ring designer and she has no idea about the exact design she would want, so these rings below have been confirmed as perfect for proposing by a bonfide expert. The process of designing an engagement ring together with your partner is also such a lovely process (we recommend North London designers Aurus London) that we don't know why you wouldn't want to do that together, whilst also keeping the surprise element with a placeholder ring. Lets not jump ahead though... to get you started we have picked out some of our favourite placeholders rings that you can buy from various small business' that will ensure a happy yes when you ask the big question. 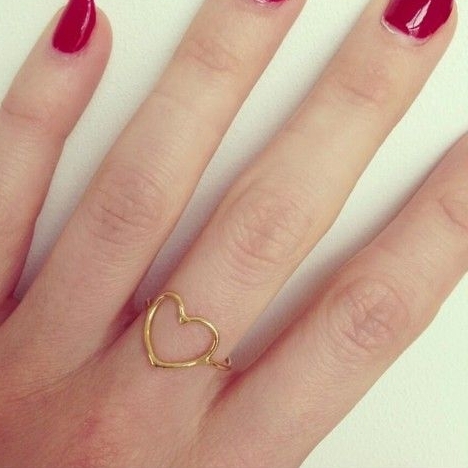 Laura Gravestock has been a firm favourite of Elizabeth Rose since 2012, and her classic written collection has so many gorgeous designs, like this solid gold heart ring, and her gorgeous monogram rings. If you're looking for a little bit of classic sparkle, look no further than the gorgeous designs at JSV. 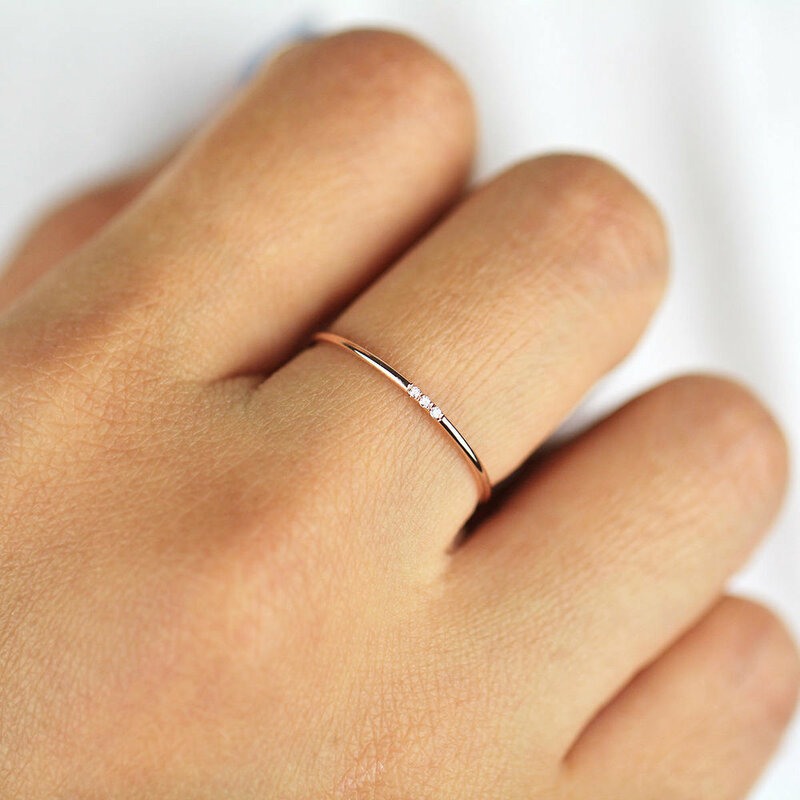 Handmade in the US these dainty rings can be the perfect engagement ring for the minimalist bride or groom to be, as well as the stand in ring. When the time comes to start your wedding shoe search you will notice the same thing as a lot of our brides, there is a serious lack of flat wedding shoes in the market, let alone pretty and stylish flat wedding shoes. At Elizabeth Rose we source the perfect shoe style for our brides, and have recently noticed an increasing number of requests for flat wedding shoes that suit our brides-to-be, bridesmaids and mothers of the bride. Our hand-painted designs mean that you can create a unique pair of wedding shoes that match your wedding flowers, your wedding outfit, or simply depict your favourite flowers, furthermore our flat styles mean that you can re-wear your shoes after the event, day to day, or even design a matching clutch to ensure that your shoes are perfect for your next event. Your custom wedding shoes can be subtle or bold depending on what you want, with our different coverage options you can have a full shoe of flower print, or simply a sprinkling of blooms around your toes. The sky is the limit, and our award winning designer Sophie can hand-paint anything, so do not think that the designs end at flowers! We can colour match your wedding theme, and monogram your name, your favourite quote, or song lyric, so ensure that your wedding shoes are not the same as the bride next to you, and personalise your shoes with Elizabeth Rose! Pantone have announced their colour predictions for 2018 and we cannot wait to see how they will be translated into goegeous weddings up and down the land! We took part in the Wedding Academy Live Pantone challange, and created a moodboard inspired by our favourite colour 'Blooming Dahlia'. This gorgeous hue makes us think of garden roses, blush wedding dresses and fresh pastel cocktails, and I'm sure you would agree that those elements all create the perfect formula for a stunning wedding set up! Take a look at our 'pink gallery' to get inspired for your own personalised wedding shoes, or check out our credits below to find out who created the other beauties in our moodboard below. As wedding season begins in 2017 so does the hunt for the perfect accessories, your wedding shoes, bridesmaid accessories and flowergirl shoes. At Elizabeth Rose London we create unique wedding shoes that match your wedding colours, ensuring that you do not have to compromise and cave in to buying plain and boring wedding shoes. Our shoes can be as subtle or as eye-popping as you want, we are all about you and designing the perfect shoe for your wedding day. So far in 2017 we are seeing a lot of blush pink peonies, blooms of roses & wisps of greenery. Wildflowers are also very popular, creating bursts of beautiful poppies & garden roses enrobed in green leaves. These beautiful contrasts and shades work perfectly when painted on satin shoes with the shimmer of the satin complimenting the colours of the floral print. We have a sneak peak of some of our Spring summer wedding shoe designs that are ready for the big day, the brides all designed their shoes themselves and even added personal details such as initials or sentimental flowers. So if you feel inspired to design your own pair of floral wedding shoes simply contact us by clicking on the button below. Our designer Sophie will then be able to bring your dream wedding shoe design to life. Choosing wedding flowers is one of the most exciting parts of the wedding planning process, they bring such beautiful colour to the room, and can have sentimental meanings too with every flower having particular associations. Furthermore, the charm and scent of fresh flowers is so enchanting and is something that will remind you of your beautiful wedding day forever, the associations of scent whenever you smell it after your wedding day will effortlessly bring everything rushing back to you, making them such a powerful element of your wedding day. Wedding bouquets also portray your personality, bursts of colour, or subtle wisps of green beautifully captivate you as a bride. So why not match your bouquet with your wedding shoes? Capturing the floral beauty forever with Elizabeth Rose London, and completely unique wedding shoes and accessories designed just for you. As with bouquets, your wedding shoes can be as bold or as subtle as you like. Throw away the misconceptions of boring ivory wedding shoes, we have reinvented the options available, and have bought completely unique wedding shoes into the bridal world, with our hand-painted designs. 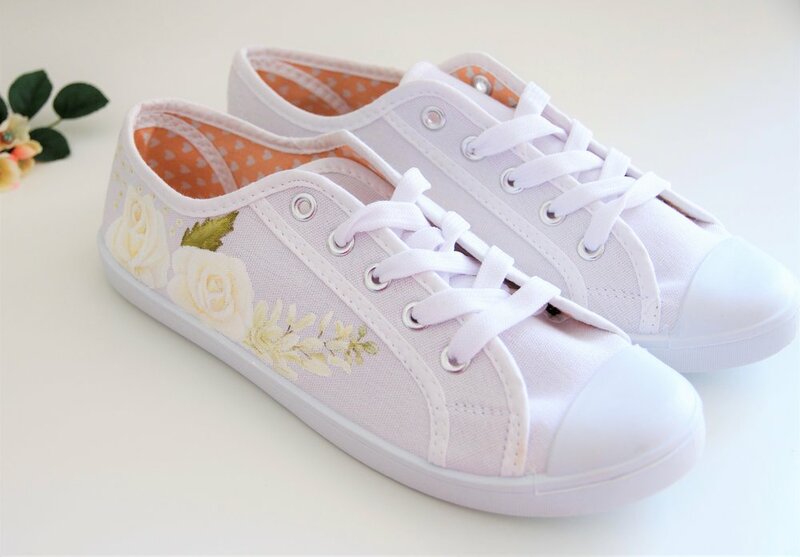 Our designer Sophie can hand-paint any composition you want, incorporating sentimental flowers and initials to make a truly special pair of shoes that you will keep forever. To give you an idea of how the design process works, we have selected some of our latest designs and put them next to their wedding bouquet inspiration. Bright pink coral charm peonies and bold green are such a beautiful palette for a summer wedding. 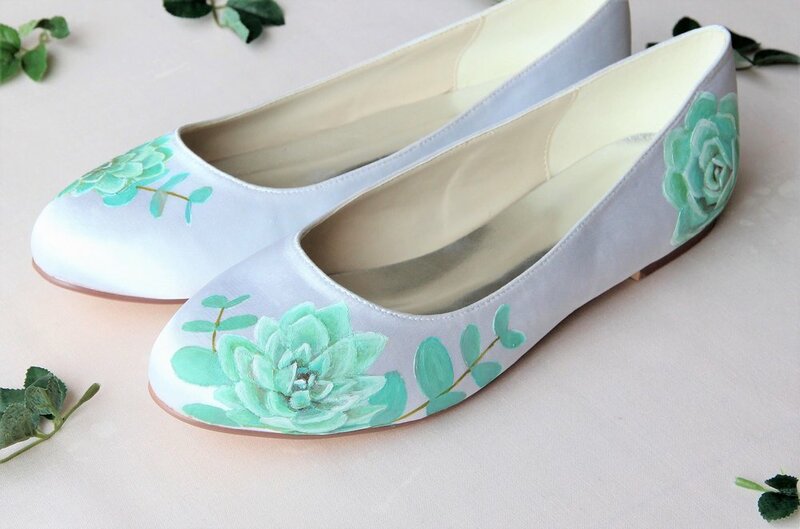 Our handpainted peony print wedding shoes are the perfect accompanying accessory to your wedding flowers. Woodland weddings are all about the flowers, and these wildflower shoes are inspired by the gorgeous contrasts found in nature. These heels are also available in wedding wedges to ensure that you don't sink into any ground whilst walking around on your wedding day. 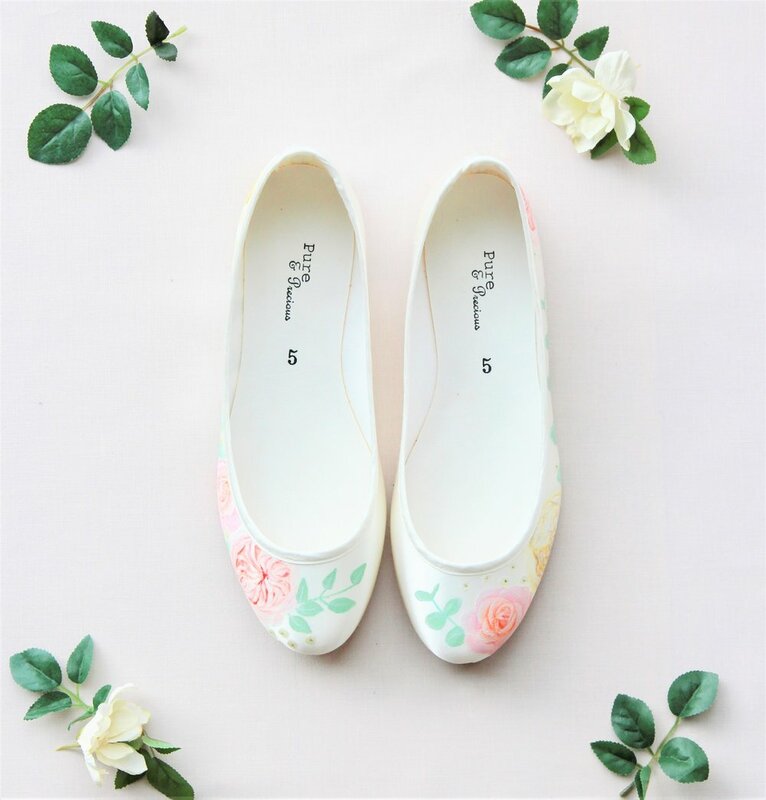 Subtle and beautiful is the order of the day with these peony and rose print wedding shoes, handpainted with pink and green to add such a beautiful powder puff of colour to your wedding outfit. These elegant stilettoes are also the perfect shoe to wear to Ascot or other special events such as your wedding anniversairy. Springtime is always such a beautiful time for seasonal flowers, and one of our absolute favourites is cherry blossom. Its not often used in wedding bouquets but we love the unique look that the branches of blooms bring to a bouquet. 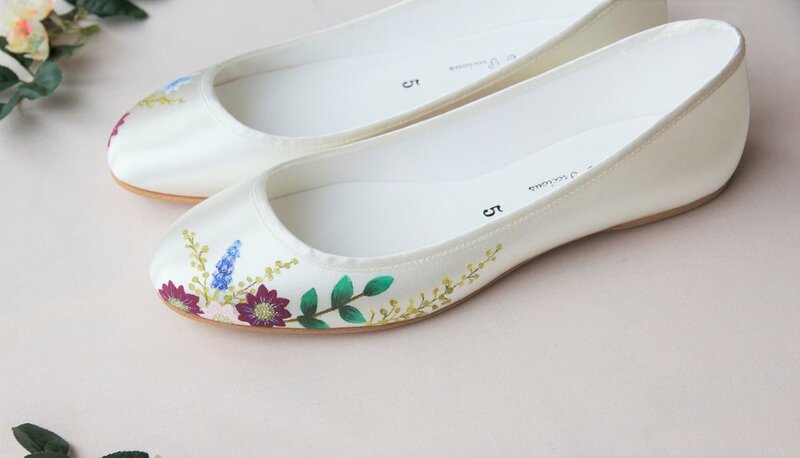 Our cherry blossom print handpainted flat wedding shoes bring such a subtle look and would make them perfect for everyday wear. Succulents are becoming so much more popular in wedding bouqets and we can see why! Sprigs of eucalyptus and bursts of succulents create a unique wedding bouquet and look gorgeous when hand-painted on these flat wedding shoes in ivory satin. The subtle peach and mint colour create such a delicate pretty palette. Now you have seen some inspiration, contact us to start designing your own pair of unique wedding shoes!